China may have cleared the way for President Xi Jinping to effectively remain in power for life, but it has not transpired without protest. 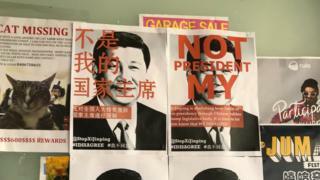 In recent days, anti-Xi posters written in Chinese and English have appeared in several Western universities. The posters have featured phrases such as "not my president" and "I disagree". Criticism of a China's decision to remove a two-term presidential limit has been heavily censored at home. The parliament, the National People's Congress, overwhelmingly passed the constitutional changes on Sunday, as widely expected. The posters began appearing on some US campuses last week, and were later reported in countries including the UK, France, the Netherlands, Australia and Canada. 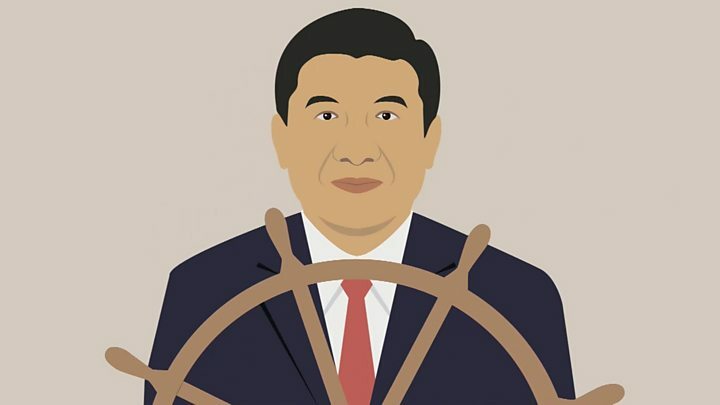 A Twitter account @StopXiJinping has been posting links to the posters for download, and encouraging others to join what it calls "our campaign". Someone operating the account told the BBC it was being run by Chinese university students and graduates who were living abroad but wished to remain anonymous. The person did not give further details. "We spoke up as we genuinely believe that Chinese citizens, overseas or at home, have the right to express opinions free from fear," the account tweeted on Friday. The phrase "not my president" has been used in other contexts, most prominently by those who oppose US President Donald Trump. In Australia, the posters have appeared in a number of universities. Wu Lebao, an Australian National University student, said he had put up the posters to raise awareness among his peers. "By posting those bills, I want to impress on them that there is a significant change occurring in China," Mr Wu said. "Xi has performed as a dictator for years since he went into power, but this move would give him more absolute power." However, several Chinese students were unaware of the campaign when asked by the BBC. A Chinese student at the University of Sydney said his peers had a range of views on the constitutional changes. "It's definitely a hot topic, but we've mostly just been joking," said the student, who did not wish to be named. "A lot of us don't really care." China heavily censors social media domestically and tolerates very little in the way of political dissent. Outspoken opponents of the government are routinely harassed by officials or arrested. So Dr David Brophy, a lecturer in Chinese history at University of Sydney, said he was surprised to see such a public display of dissent from the overseas students. "There is a strong sense among some students that it's best to raise criticism within their community, rather than air them more publicly to a Western audience," he told the BBC. Such discretion is fuelled by concerns about whether students abroad are being monitored by China. "For anyone who plans to go back to China in the future, they do incur a risk by being visible as politically active," Dr Brophy said. The Twitter campaign has advised students to put up posters only at night, and to wear face masks. Video Is China trying to influence Australian politics?